I think Spanish cuisine is one of the best in the world, but I don’t think I figured that out until well after I backpacked through Spain (with no money) right before college. It seems similar to Italian, but its flavors are quite different and distinct. One of my favorite Spanish culinary ingredients (besides saffron, of course), is sherry — it is commonly used in a variety of dishes, and it adds a fantastic depth of flavor. This delicious meatball dish is simple — it has the sherry, but I don’t think you’d be able to pick it out. So good, I hope you’ll try these tonight! 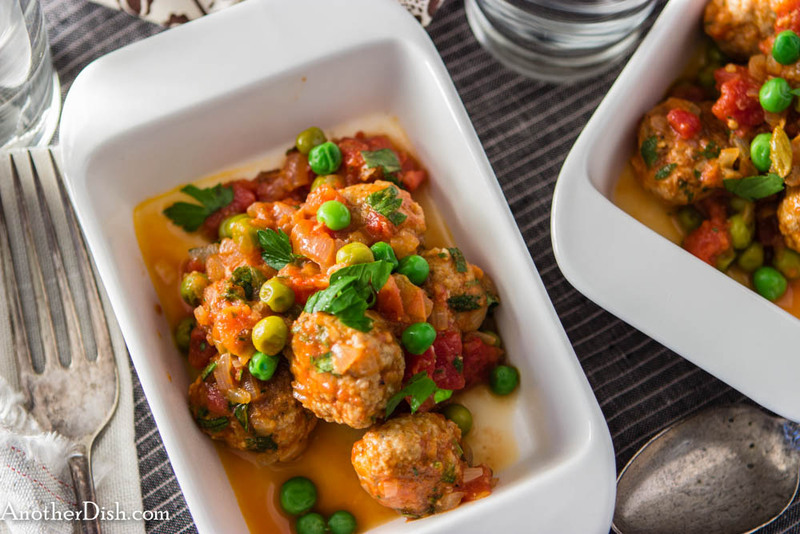 In a large bowl, mix together the ingredients for the meatballs with one hand until well-incorporated and smooth. Cover and refrigerate for 30 minutes. Remove from fridge, and form meat into meatballs, about 1 inch in diameter. Heat 2 Tbsp olive oil in a large skillet over medium-high heat. Add meatballs and brown on all sides (I like to swirl and toss them in the pan so they brown evenly), about 3 minutes. Remove with a slotted spoon to paper towels. Set aside. Add the additional 1 Tbsp olive oil to same skillet over medium-high heat. Add onion and cook 3 minutes. Add garlic and cook another 1 minute. Stir in wine and sherry. Turn heat to high. Bring mixture to a boil and cook 1 minute. Add tomatoes, tomato paste and chicken stock. Bring to a boil. Reduce heat to low and simmer 10 minutes. Stir in the cayenne, salt, peas and meatballs. Increase heat to high and bring to a boil. Reduce heat to low and simmer another 10 minutes, or until sauce thickens. Season sauce with additional salt, if desired. Serve as part of a tapas meal (serves 6), or as an entre with rice and a vegetable (serves 4). This entry was posted in Main Dishes, Pork, Spanish, veal and tagged Cooking, Food, Food Photography, Foodie, Recipes, Spanish Food on August 25, 2014 by AnotherDish. Thanks for the comment! Garlic salt will be fine. Please let me know how it turns out for you. Hi, will surely let ya know how it turns out to be. Thanks for the suggestion..